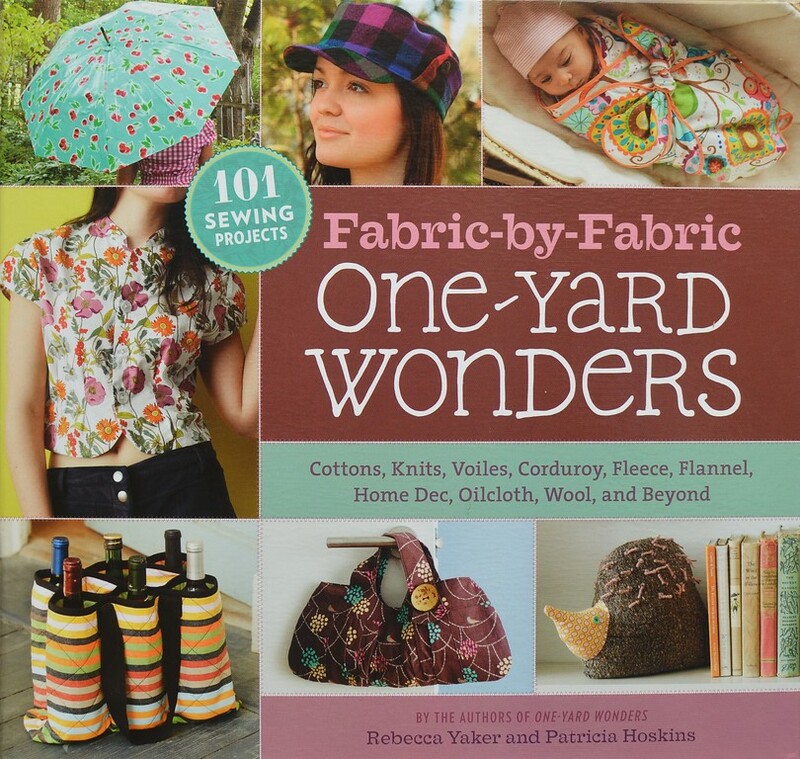 ikat bag: One Yard Wonders Book and Fabric Giveaways! We're taking a short break from the Lights Project to do a giveaway! 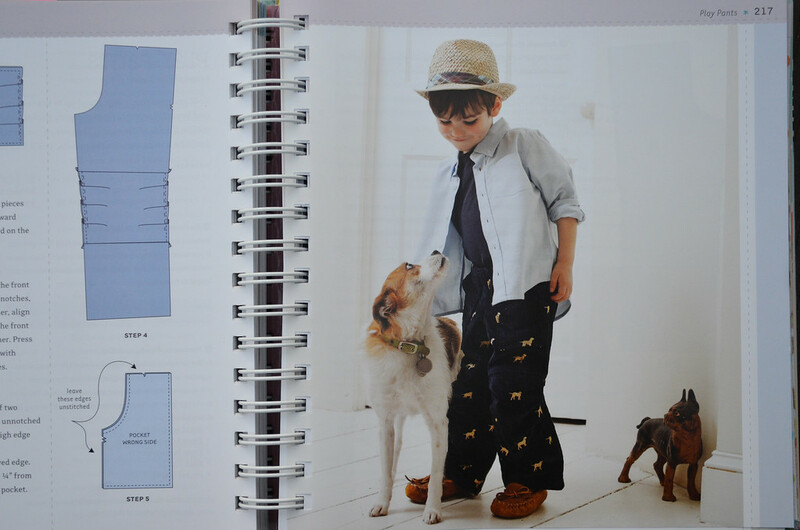 Remember this post about the launch of that new Fabric-by-Fabric One Yard Wonders book? It's now on sale everywhere, and I'm excited to be reviewing it for you here today! I sew a lot but I don't buy a lot of sewing books. 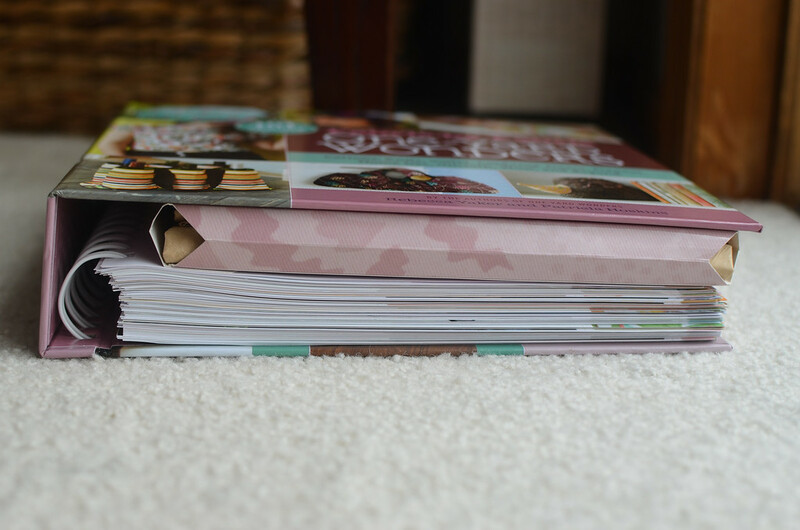 At least, I don't buy a lot of the glossy-color-photo-gorgeous-projects types of sewing books. I buy drafting books written in the previous century by European and Commonwealthy folks, on which pages are hand-drawn black-and-white sketches of basic blocks and darts and general pattern-drafting stuff. Technical, not particularly inspiring as far as specific projects go, and any gratification from reading such books would definitely not be instant. Want to read my rave review of such a book? Here you go. 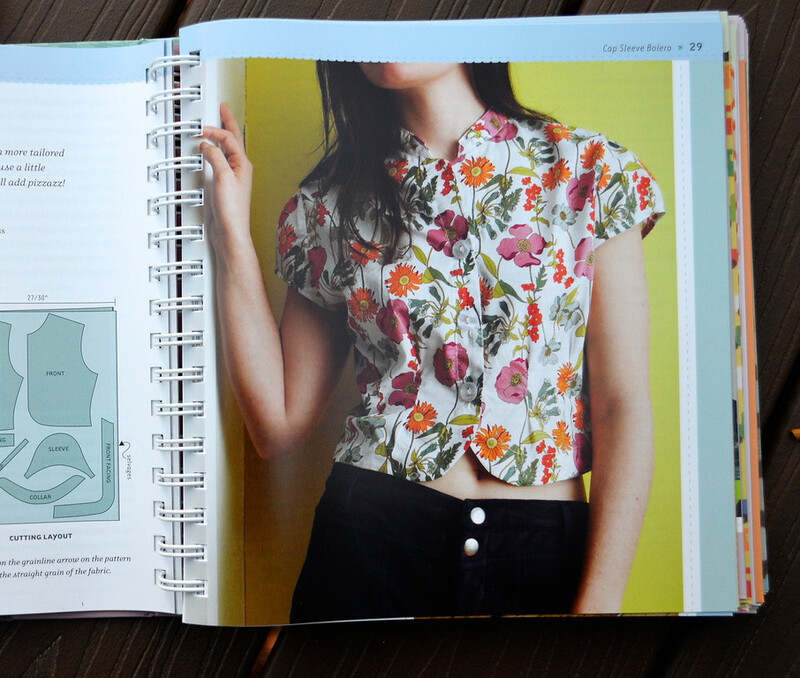 When I'm in the sewing aisle of bookstores these days, however, I do like browsing the modern sewing books - the ones with the beautiful, beautiful photos and quick-finish garment sewing and the simplified pattern-making. They are gorgeous books and, unlike the drafting books, very easy to read. They are full of tips and tricks that I've never heard of and am very excited to discover and file away in my brain. They are also informative in how they reveal current sewing trends and the primary market of the modern sewing movement. It's all hugely fascinating. 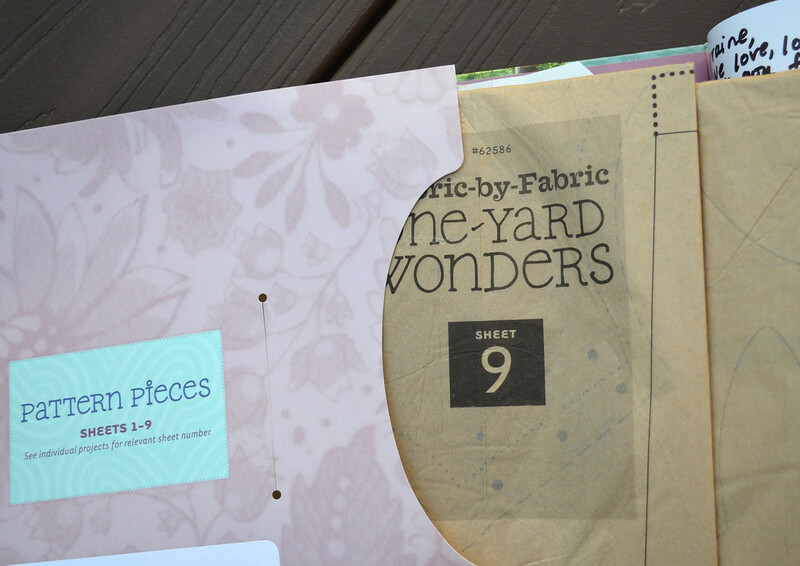 And then there's the new Fabric-by-Fabric One Yard Wonders book. It's just been launched, it's available for sale, and you want to know all about it! First, it's huge. 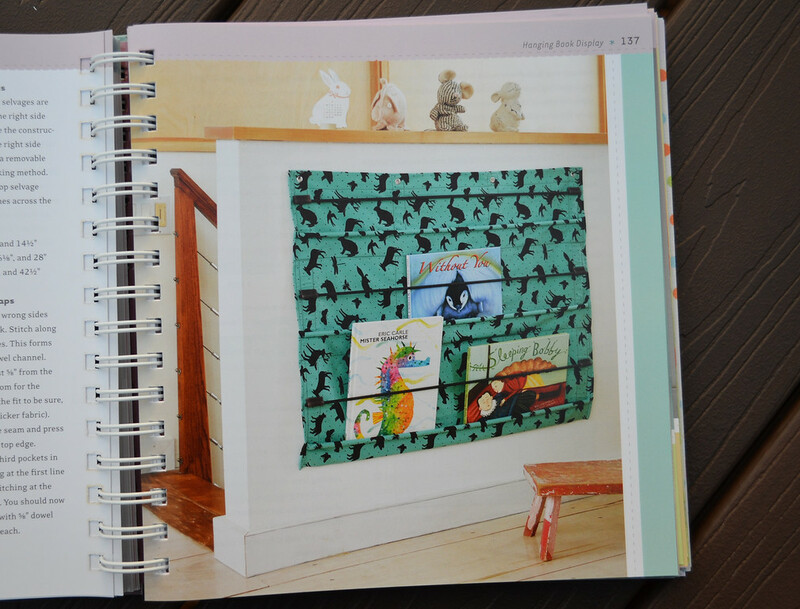 It contains more than a hundred projects, spread out over 9 pattern sheets. 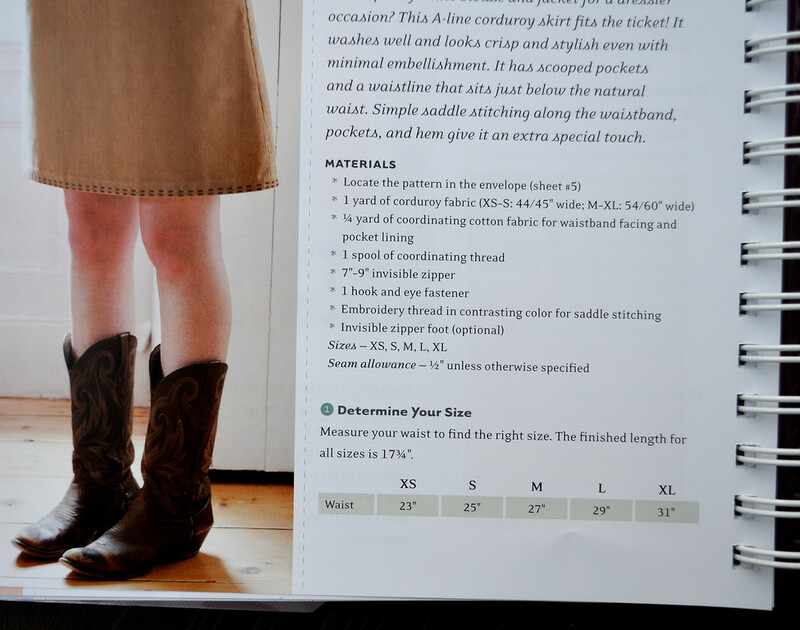 Each fabric section begins with an introduction to that category of fabrics, and how to work with them. 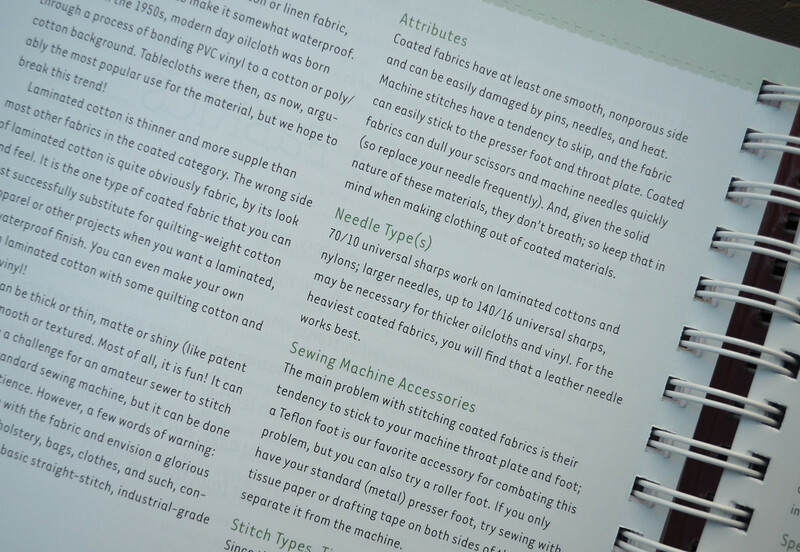 Over all the specific chapters is an introduction to the basics of fabrics, including general sewing techniques, stitch knowledge, lists of must-have notions and equipment and a very useful fabric cheat sheet. 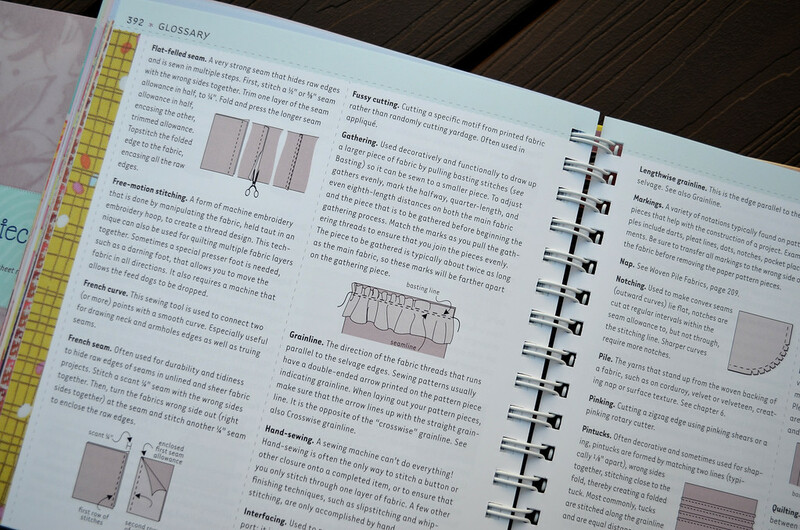 At the end of the book is an illustrated glossary of many common sewing terms. Beginning seamstresses will especially appreciate this information - it covers what everyone takes for granted that everyone else knows (and therefore might be too shy to ask about) but in reality might not. 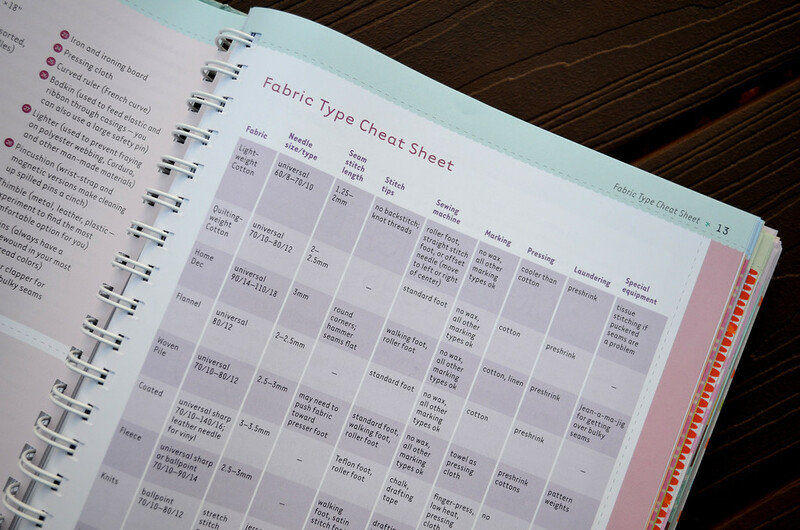 More experienced seamstresses will enjoy having all the stuff they're supposed to know, organized for them in ways they can actually access, and discover many gems of new tips and terms in the process. 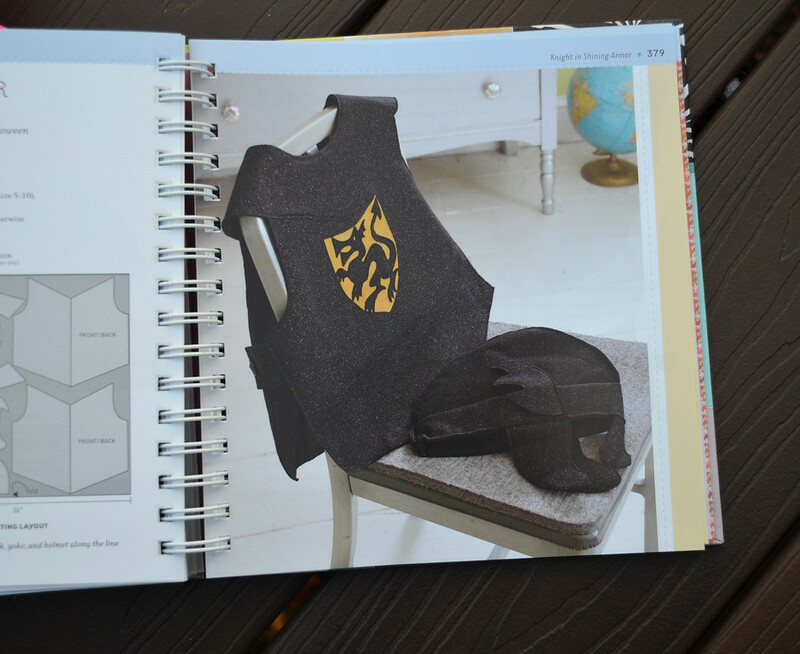 in addition to the usual materials list and cutting/ sewing instructions. The instructions themselves are detailed and illustrated by clear diagrams. The level of difficulty of a projects is commensurate with the number of pages it spans - some books I've read attempt to pack projects into quick bites, regardless of how simple or complicated they are; this book does not, and is all the better for it. Even I can figure them out! So, do I like this book? Yes!! Not only because my projects are in it (whoo! ), but because it's well-organized, covers a variety of different projects, in different materials, for different purposes, in different styles and for different skill levels. If you've just started to sew and want to beef up your projects resume, this is a good book of practical items you'd actually use. 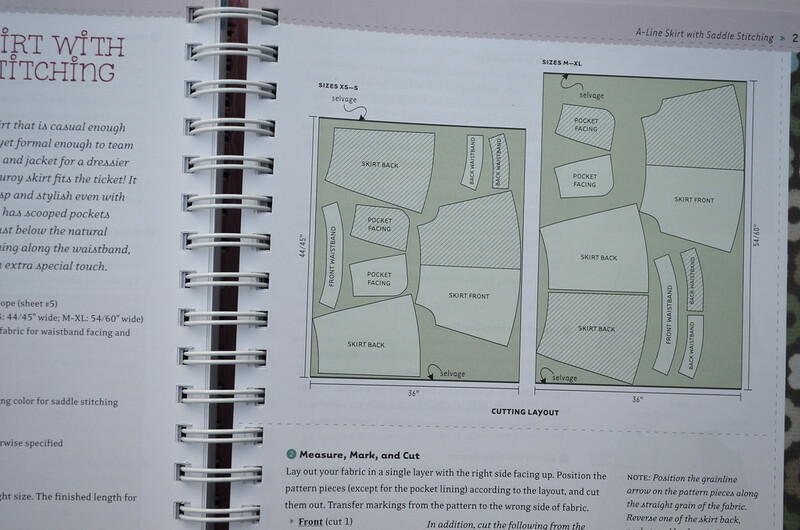 If you've been sewing a while with your comfort-zone cotton fabrics and want to expand your repertoire some, this is a good book to step out with. Now here are some of the projects! Storey Publishing is very generously giving away one copy of this book to one of my readers! You will need to have a US mailing address to get picked for the book. To celebrate the launch, I am also giving away 5 one-yard (of course) pieces of fabric to five readers (who can live anywhere in the world). So something for everyone, regardless of where you live! Anyone can enter the giveaway. All you have to do is leave a comment that answers this question: "What have you sewn recently that challenged you?" Make sure you leave (or provide access to) an email address where you can be reached. Make sure you mention whether you live in the US or not. Leave your comment by Dec 22nd, midnight. I will do a random-number drawing on Dec 23rd before we leave town to be with family for Christmas. The first commentor picked who has a US mailing address will win the book. 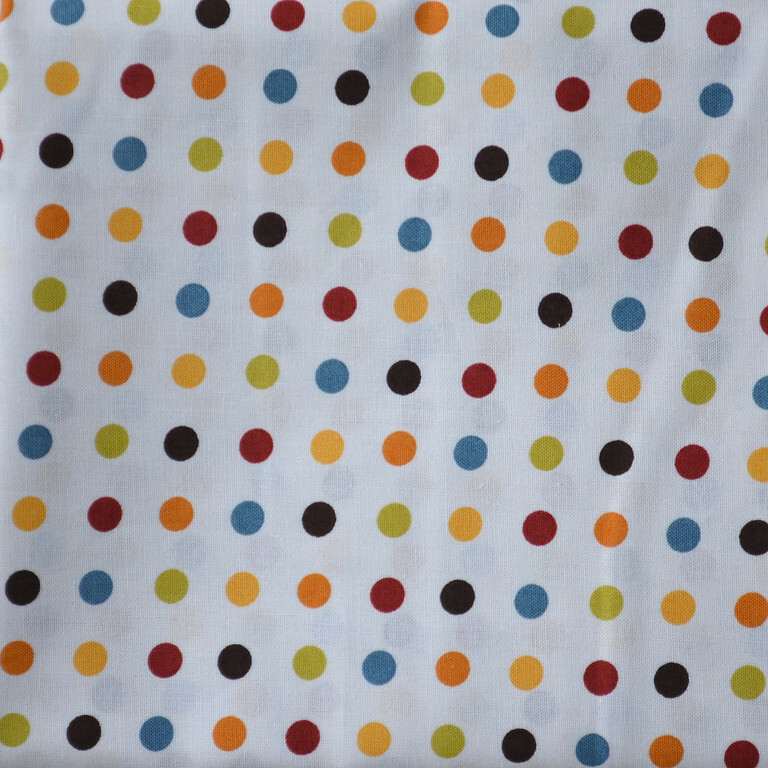 The next five commentors picked (from anywhere in the world) will each win one yard of fabric. Fabric-by-Fabric OYW is making its rounds on its blog tour, so check out these other sites for more reviews, photos and more chances to win copies of the book! Woo! I have a one yard wonders book that I bought years ago and I LOVE it! I would be thrilled to win a new one! I have recently sewn an apron and although its not very challenging, my old sewing machine can sometimes make it difficult! But I keep pushing on! and I live in the US, florida to be exact! I've just sewn New Look 6880 girls blouse, the collar was a real challenge! Also I made a Market Skirt with is lovely and simple but the Gathered Pockets are a challenge and I used eyelet to make them! I recently sewed a formal dress. I mostly do kids clothes, so this was more of a challenge! Thanks for the giveaway! Wow! This looks great! I love quick, small projects!! Most recently I've been putting together a hanging swing for my kids. I have no pattern to go by, so I'm trying to wing it. It's been a challenge, but I think will turn out really cool!! I do live in the US. I've been reading your blog for a long time, but haven't commented before. You've been a big inspiration for me to learn how to sew, and I've just started in the last few months. As I am just starting to sew, everything I make challenges me! I decided to make my family's stockings for Christmas this year, and I have just finished that. hello ! the last challenging project I made was a pair of pants, I had never made one before, and I found it not so difficult, at last ! 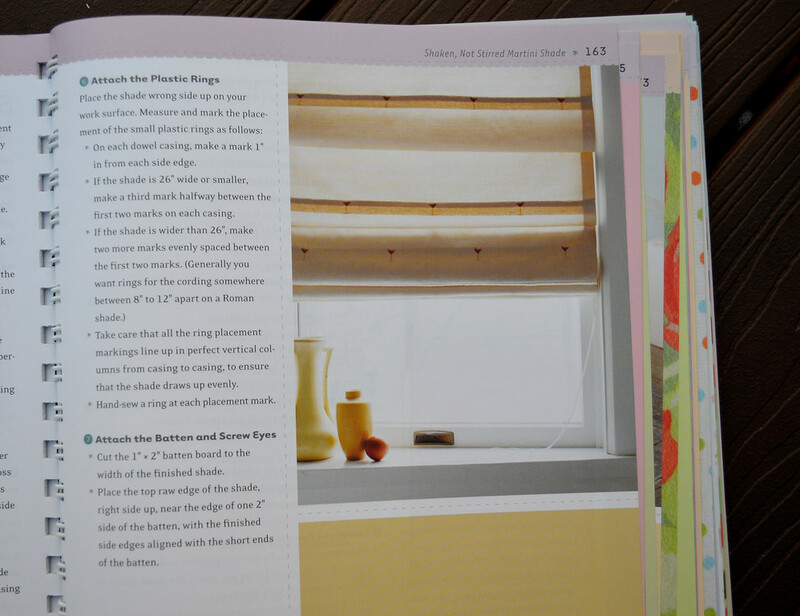 I would love to win this book or some lovely fabric. I am a beginning sewer, so the last thing I sewed that challenged me was adding zippers to the pillows I'm making for Christmas presents. It took me a few tries to figure out how to add it to one side without the ends of the zipper tape poking out. I live in the US and my e-mail address is jessica_mcmillen@yahoo.com. Lovely book; I'd love to own it. The most challenge I've faced lately is sewing a top out of velvet that will hopefully be done for Christmas wearing. It's not the most fun fabric to work with! I'm in Wisconsin! The fabric that most challenged me recently was working with clear vinyl. Tissue paper solved the problem. I recently sewed curtains for my son's room. Getting the facing right and lining all the animals up was challenging to me. Love your site! Keep it up! I made a back pack for my 4 year old daughter. My challenges in sewing recently have been in undertaking difficult projects. Yay! I have a US mailing address, and I would love this book! About three months ago I made a dress for DD's birthday. I made the pattern myself from a sloper (which I learned to make from your drafting series! ), but I think I put too many tricky things in. I almost maxed myself out. . . . Lined bodice, petal sleeves, faux placket and faux buttons on the back, keyhole neckline. Phew! But it turned out really well! 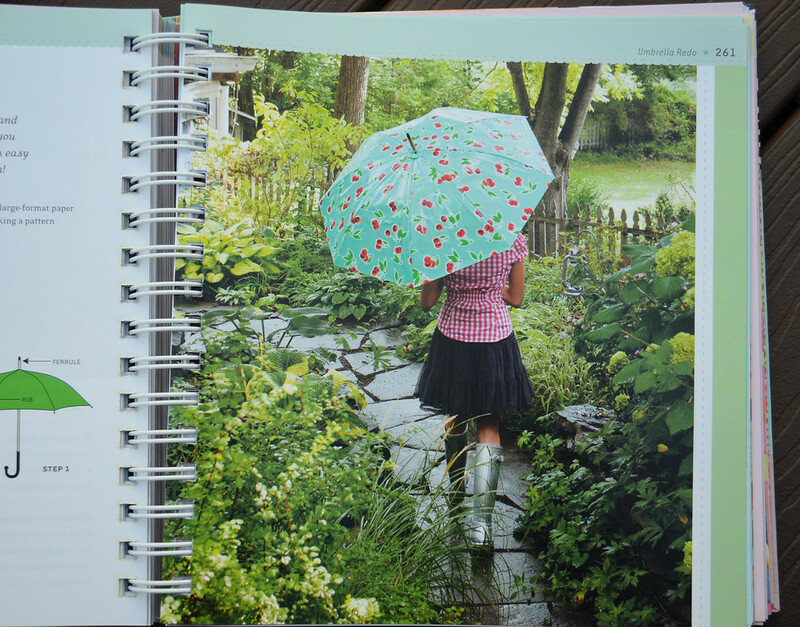 This is a great giveaway, I really liked the previous one-yard wonder book. I'm still tackling a bag I've been designing to be a dolly carry-all for my daughter. My recent sewing challenge was knits... I made a pair of yoga style pants for my girl. I have a US shipping address - live right on the border. I did a challenging 3-D quilt. Yes for U.S. Sadly, my sewing machine has been neglected for months... so the last thing I sewed that challenged me is the tunic top I made for myself last winter. (Making another, with improvements still is on the to do list). Thanks for the giveaway and congratulations on the book! It looks great! This looks like the perfect book for me! I am a novice sewer. I tried to make myself a dress with a pleated neckline and it was a fail. I still haven't figured out how to fix it. It is quite a challenge! I am still working on Oliver and S cord pants for my girls. Georgineb1 @ gmail dot com. And I live in IL. Thanks for the giveaway! What a cool book! I would not classify myself as anything but a beginning sewer but I'm getting better. I attempted a reversible vest for my little boy last month. It was very straightforward but I tried to make a pattern from a t shirt and ended up with one vest that was too small and then when I tried to make it bigger it was too big! I learned the hard way that just added a 1/2" all around is not the right move! I have know how to sew my whole life but am just a beginner so everything I sew from a pattern is a challenge!! about to start a blouse with pattern mods...eek. I am tackling trousers and it's not going so well. They are not fun to fit. I am in the US. Would love this book! Recent challenge for me was a todler blazer which has two pieces sleeves. Luckily the result was quite good. Hi from Germany! I made a nursing dress from an Elizabeth Lee pattern. The challenging part was all of the fitting and alterations required to make the dress look more modern and not dumpy. hfygirl(at)yahoo(dot)com. Made a double wedding ring table runner this month. Wow, that actually took some thought. Yes, I live in the US. I sewed a dress for my daughter's birthday. It had poofy sleeves that didn't like me when I was sewing them, but they were really cute once they were all sewn in. I live in the us. Just recently I sewn a cover to make for my dog's bed. Now this isn't the outside cover this is the cover underneath the main cover. Its just difficult because its large. I made two camera bags-never again. I have made a lot of purses, pouches and totes. None of them were as challenging as these camera bags! I have to say that I just love your blog, I really enjoy the tutorials. Okay my most recent sewing challenge was an Oliver and S dress for my daughter. It had pin tucks, a curved yolk and the instructions used techniques that were new to me. Happy holidays to you and your family. Okay, I may as well get my hat in ring. No. Not that. Name in the hat... that's what I want to say. What have I sewed recently? That depends on the definition of "recently." I sewed a button on a shirt when I was in grad school in 1967. Does that count? It WAS a challenge! I do live in the USA, and if you don't have access to my e-mail account through this response, you can notify me by phone. Thanks to the publisher for this fine offer. And to you for yours, although one might be suspicious about how altruistic your motive is. 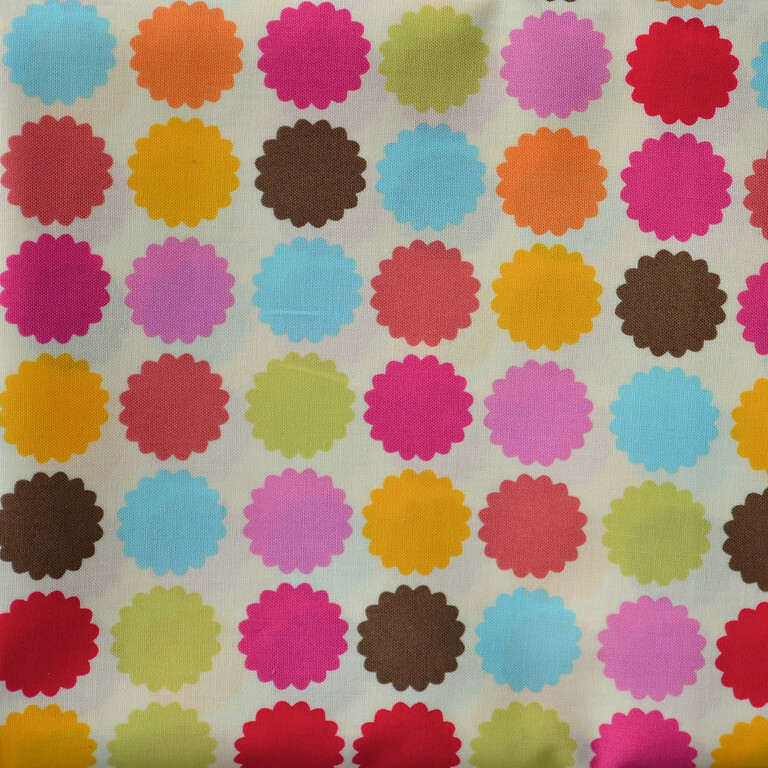 Maybe you are just cleaning out your fabric cupboard to make room for 2012 designs? Hmmmm? I tried drafting a skirt, and it didn't work out. I'm sure it would have worked better, had I not had three children climbing on me and tried to do it quickly rather than making sure I got everything right! Do your kids pull on your arms whenever you try to type/sew/cut? My real challenge, though, has been getting projects made! I need to work on that!!! My last sewing project was for my husband, making a bottomless dufflebag to attach to the top of his pulk. It ended up not being as challenging as I expected. I just hate making up my own pattern for things. I am from Canada. I am sewing a bunch of dolls as Christmas gifts and while it isn't a very difficult project, I have never sewn anything like this before. I find myself having a hard time with the finished product and especially their faces. I want them to look just like all these cute dolls I see on Etsy and they aren't quite there. Maybe this next batch will be more encouraging. I'm learning how to quilt and it is pretty challenging! LOL Especially last night trying to organize all my church ladies helping to sew a quilt! I live in TX! 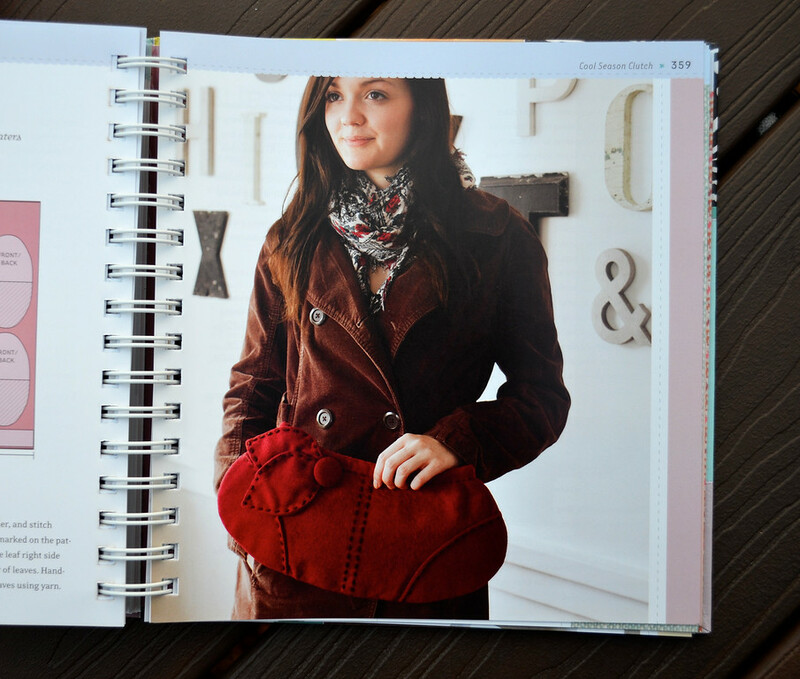 missysaprons@yahoo.com I love that hat on the front of the book and cannot wait to make one! p.s. the book looks *fantastic*! I've been making Christmas dresses for my girls, which, with the stretchy velvet on top, and the non-stretchy fun fabrics on the bottom, have really been all too challenging for me. 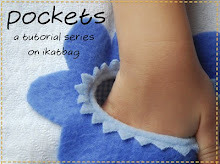 I was recently challenged when sewing a sleep bag with feet for my daughter. It took me quite some time to get the legs the correct width. I live in Massachusetts, and my email is esk dot rojas at gmail dot com. I love your blog! Thank you for not only being an excellent seamstress, but for your general craftiness as well! I love the mix of both worlds. US resident - I started making doll clothes for the American Girl dolls & had only made toddler clothes before so making doll clothes that were substantially smaller resulted in a challenge for me. I'm still working out the kinks - wish me luck! Thanks for the giveaway - happy holidays. My last big challenge was probably Kipper the Dog (my son's Halloween costume). I was adapting a dragon costume pattern to look like a dog. End result: he loved it! I have a US address. I'm a newbie at sewing (like only been sewing since Thanksgiving when I got my mom's old machine) and while it may sound super easy, it was kinda hard for me to figure out how to do it on my own, but I recently made a car seat canopy for my baby girl. But I had to make it a little more difficult than normal (because I'm just like that) by making it out of little 4 x 4 squares, sewing them all together, and then figuring out how to finish it. It took me a week, but I finally figured out how to do it. It isn't the prettiest thing in the world and the squares aren't all straight, but I am so proud of it and can't believe that I was able to make something like that, and now all my friends want one for their kids. 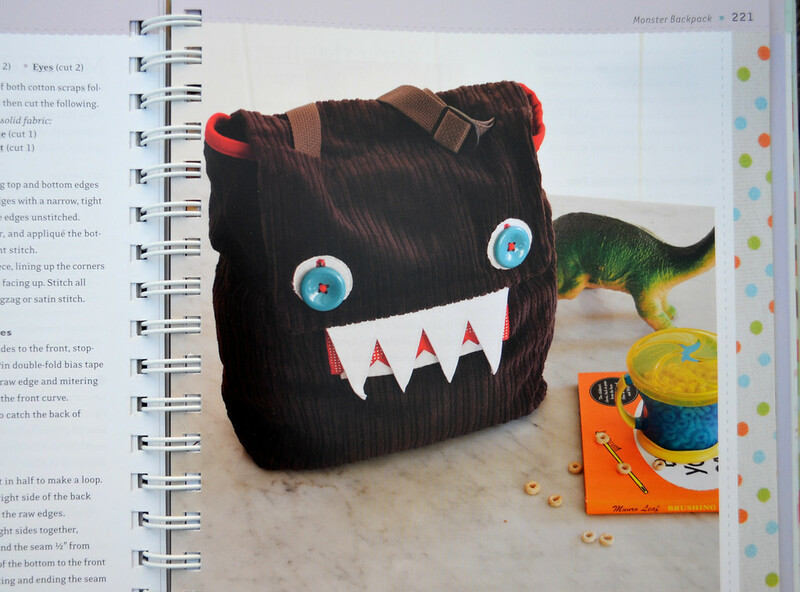 I'm now addicted to sewing and really, really, REALLY want this book! Merry Christmas to you and your family and readers as well!!!! Hi Lier! Thanks for the chance to win! I live in Canada. 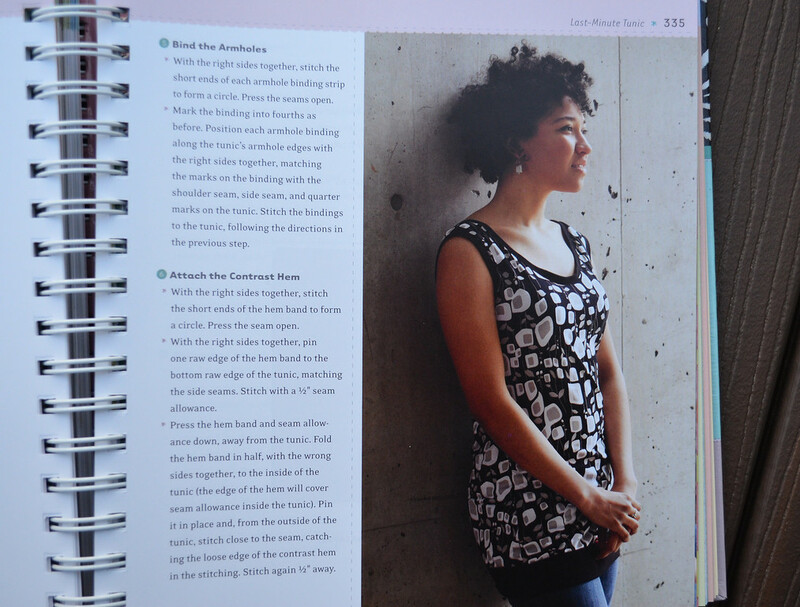 Recently, I have started sewing some patterns from the Ottobre magazine, which I have found challenging, as they do not have the same level of explanation as the patterns that I am used to dealing with. I'm in South Carolina! I recently sewed a dress for my daughter that was a little bit of a challenge. Not quite a from scratch project, but I recently tried to take apart a coat to take in the waist. Needless to say, I was a little overambitious and not as well-prepared as I had hoped. It all came together in the end though! My email is vickiechiou(at)gmail(dot)com, and I do live in the US. I have the first one yard wonders book checked out from the library right now. I'm going to make a few things for Christmas. I would love to see all the new projects in this one! My biggest current challenge is to make a fitted shirt (using HotPatterns Great White Shirt pattern). The shirt is not so hard to sew, although getting collar points to match isn't for raw beginners; what's hardest for me is getting it to fit a figure with, shall we say, untypical proportions. Thank goodness for muslins! Thanks for the giveaways, and happy holidays. I'm entering to win some of that lovely fabric, I'm in Australia. My last challenge was a sweet sundress I made for my 6 week old niece. I assumed (never a good idea) the instructions would be clear, but halfway through I realised they weren't and I really should have planned out the construction myself first. Lesson learned, don't be so gung ho next time! Thanks for the chance to win, I'm definitely considering purchasing the book after your review, it looks fantastic. I've been sewing bags for the past 2 years and recently I've moved on to more advanced designs. 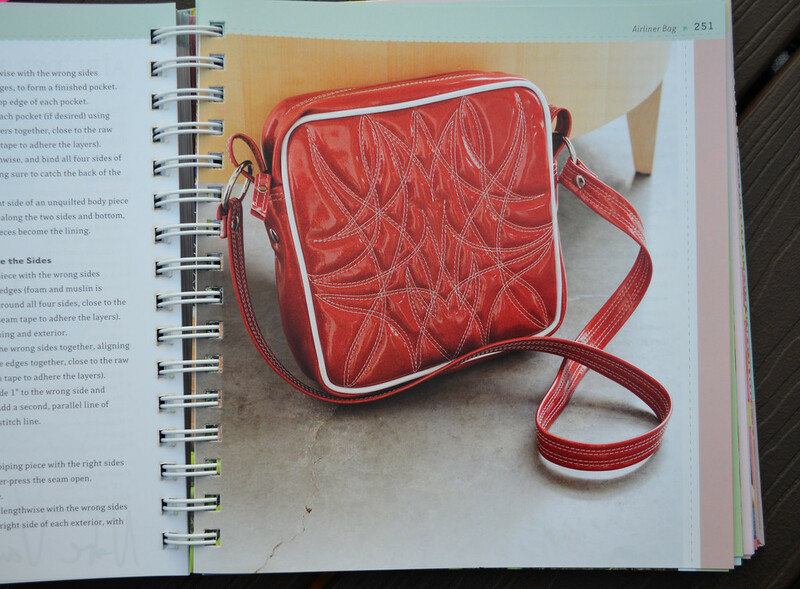 And now my friend has fallen in love with one such complicated bag and so I'm back struggling with the wretched pattern! Oh. My. Gosh! You designed the Pig and Piglets! That's one of my favorite projects in the whole book. So cute and clever! I have read "One Yard Wonders" before and, while I have not in fact made anything from it yet, I absolutely adore the book! The most challenging project I have made would have to be this plush ( http://dragon-lu-ver.deviantart.com/gallery/#/d48ag0i ), it took me absolutely forever, but I am very pleased with the outcome. Hello! I just completed a twin-size yo-yo quilt for my oldest daughter's bed!! It took forever (all 800 yo-yos were hand appliqued onto the quilt), but was definitely worth it. Now I'm about to start the second one for my second daughter's bed. I do live in the US (beautiful Wyoming) and would love to win the giveaway! Happy Holidays!! I have been trying to make this great travel wallet but have not perfected it till now. The binding part is just driving me nuts! I live in Melbourne, Australia and would love to win a yard of those gorgeous fabrics. Thanks! most anything you do for the first time can be a challenge. My projects lately are not really that difficult, but i find them challenging enough simple because its the first time for said project. What i find most challenging about sewing is how little physical space i have to work with. We have a family of 4 in a 500sq ft apt and i put my sewing machine up on a wooden tv tray!!! making up patterns for monkey costumes was challenging this halloween. I'd love some more patterns in my sewing room to at least get me half way. My recent project that challenged me was to make a bag for my daughter for Christmas. It was to carry a magnetic paper doll set, along with a dry erase board to play with them on. It was my first project that I made up entirely on my own and didn't follow a tutorial/pattern or even get an idea from online. I think it turned out pretty well--hopefully she thinks so, too! Would love this book! I just sewed up a new car seat cover for a friend's newly adopted baby to come home in! Didn't have a pattern so I just took the old one apart and used it! Wanted quilted fabric like the previous one, but could only find a cute novelty cotton, so I put Warm and Natural behind it and quilted it! I think she will love it! Hi. As I live in Australia I guess I will have to be happy with fabric (YEAH!!!) not the book(BOO!!!!). Thanks for including us internationals in your giveaway. The thing that has challenged me recently was a nappy bag that I am designing, I made a small version to see how it looked and if it would work but that just raised more issues and things that I need to add. But when I finish it, it will be the best nappy bag ever. Not a lot of sewing these days, but the most recently project which challenged me will be the prinses dress I made for my daughter. You can see it here; http://madebydinges.blogspot.com/2011/09/prinsessenjurk.html. (but you've already seen it). It's made without a pattern, from just a schets my daughter and I draw. So I really would like to take the chance of winning the fabric. Oh, and I do live in the US. Over here in Texas, I just sewed a pair of PJ bottoms with NO PATTERN! I've never done that before. The pants are a bit wonky in places, but are super comfy. Oh phooey for not living in the US. I mastered fitting a zip (in a bean bag) back in the summer - hardest part of that was remembering to keep reading the instructions. But currently I am trying to put together a cover for an electronic reading device (not allowed to say the word until after Christmas). Ought to be straight forward but perfection is evading me. I am looking forward to being able to test it with the real thing rather than the lifesize cardboard mock up I am using! I live in Germany so it's great that the fabric part of this giveaway is open to those of us with non-US addresses! I recently sewed my first paper piecing project. It was complicated at first - but I got the hang of it! I am from the US. Thanks for doing this giveaway! But I am pretty easily challenged! I recently made my very first toque (which should give away the fact that I live in Canada). It was hard because the pattern said 3-4 years but barely fit my 9-month-old. I had to figure out the enlargements on my own - tough for a newbie like me! Hello there, LiEr! Let's see, yup, right here in Texas and getting ready to tackle pillow cases, but the most recent challenge has been embroidering my kiddos hand prints onto a pillow (also sewn by me) for their grandmother. Thanks for such an amazing chance - I love to mix in the smaller projects with the bigger challenges! Merry Christmas to you and yours! I recently sewed a dress from knits. Eek! I live in the USA! Thank you for the preview of the book. Its on my wish list. :) A challenge this year for me has been hemming school pants. (I'm more of a knitter with a yarn obsession than a sewer at this point in my life.) My son has grown 5 inches in less than a year...I didn't dare cut his pants to make hemming more manageable. *lol* So its been a bit of a fudging job to hem up pants 4 inches and make them look serviceable. (It would be us, move to a small US city..ok town of 9245....and attend a public school that requires uniforms....*sigh*) Should the random number generator want to pick me...hint hint... you can find me at lckent at hotmail dot com. I'd love to win some fabric--I don't live in the US--I live in Canada and I just won a copy of the book elsewhere--so excited to get it! My recent sewing challenge has been sewing bags for my daughters for Xmas...the naturalist bags from the sew liberated kids book. Using actual metal gromets! And Velcro! :). They are turning our well. I'm in Canada but my sister lives in the US...can I use her as my US mailing address? Either way, thanks for the chance, the book looks amazing. My recent sewing challenge came from my sewing machine - it was NOT cooperating with me as I was trying to wrestle out a travel sewing case. Turns out all the machine needed was a tune-up. (phew!) I live in the US and I'd love to win a copy of this amazing-looking book! Oh my gosh! I'm working on a set of placemats and they are getting the best of me. I've ripped more stitches that I care to count. I'm hoping Santa brings me a new seam ripper with a lighted magnifying glass attached. I love the One Yard Wonders book that I have, and I am happy to see there is a new one coming! The most recent thing I sewed that was a challenge was actually from that book! Well, OK... I made the Toddler's Art Smock, which itself would have been easy, but I decided to make it reversible! It turned out great aside from my terrible binding! The latest sewing project that challenged me was an embroidered carseat head rest for an infant carseat. I have the first book and have enjoyed making some of the projects. My most recently challenging project is the little doll house from the book, but that was due to my improper measuring. I'm in the US. This is an amazing giveaway. Thanks for the chance. The most challenging thing I've done with sewing lately is learning to fit clothing to myself. Kids are lots easier. They have less curves. Also I recently sewed a HK softie for my daughter using your tutorial. It turned out fantastic! Thanks for the great blog. I live in Utah. I am currently challenged by a sewing project of making nativity finger puppets for the special kids in my life. I think Santa is getting me a new machine, so I would love to win this book, so many fun things to try! What a wonderful book! My latest challenging project was a Rapunzel costume for my 4yo daughter. Tons of glittery sheer fabrics, four kinds of ribbons, a yarn wig, of course and a petticoat to foof it out. Cannot wait to see her in it on Christmas morning! I just made a coat for my daughter using a pattern. I am hooked! I usually just "wing it", but didn't know how to wing a coat. It came out great. 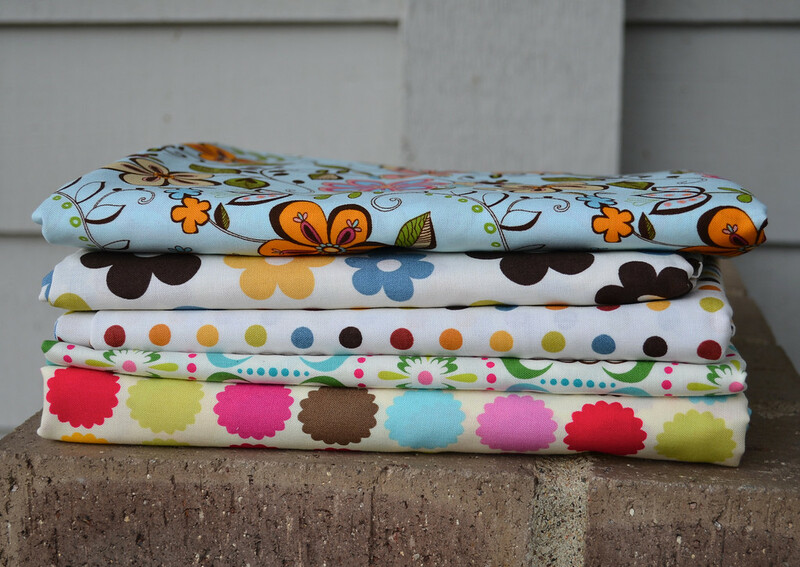 I am excited to sew more using patterns! 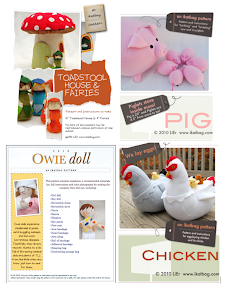 Let's see, the latest most challenging project I worked on was creating my own doll pattern. Well, the dolls were easy. But the clothes were a lot more work. I'm still beginning, so it probably wouldn't be difficult for more advanced seamstresses. But I'm really happy with what I created. I have recently made a winter linned coat. It turned out extra warm and exotic but I almost gave up a few times. I do not have a US mailing address. Please contact me at: manonwinkeltje@gmail.com Thank you!!! This book looks great! It is now on my wishlist. The most challenging thing I've sewn recently is doll clothes. The tiny pieces and tiny seams have proven to be fussy. Thanks for the giveaway. I am currently sewing Christmas stockings for my family of 4. They are definitely challenging me, and I'm not sure why. It seemed like such a simple project! Recently, I was given some really cool 'boy' fabric. It was long and narrow - 50cm x 25cm - so I had difficulty using any of the patterns I had to make a cross body bag for a little boy. Eventually, after a sleepless night, I made up a simple pattern that used up all of the fabric. I ended up with a no-frill cross body bag that even had a pocket, perfect for a little boy! Today, I tried to make Hoopla storage bags (http://rhgarza.blogspot.com/2011/10/hoopla.html) with my kids. I didn't double check the dimensions before we started sewing, though, so I ended up with 3 sets of bags that are too tiny for my hoops. Such a simple project, but it sure challenged me! My Gmail address is ulrikedg, and I live in the US. I've made a costume for my son which was the first thing I ever designed all by myself. i sewed long sleeves to a t-shirt. it was challenging but turned out good. The most challenging thing I have made recently is a pool bag for my sister. She wanted several specific desires including but not limited to: laminated cotton fabric, elasticized pockets, mesh pockets, zip pockets and piping. 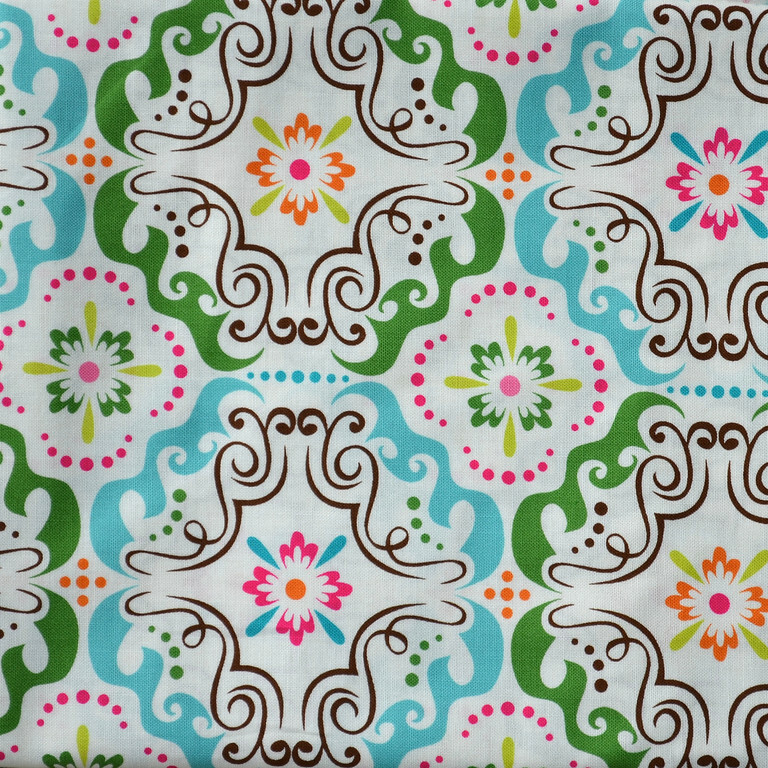 So between drawing the design, doing my math correctly, mildew-proof piping and that cursed laminate fabric - phew. I live in the US and I would love to make something nicely planned out by somebody else. For now. At the beginning of the summer I sewed a dragon costume for my son, who was 2 months old at the time. It was, I suppose, a simple enough project - baby stuff isn't really fitted - bit it was a challenge for me since I didn't have a pattern or anything. This book would be so much fun! So many projects I would add to my list. 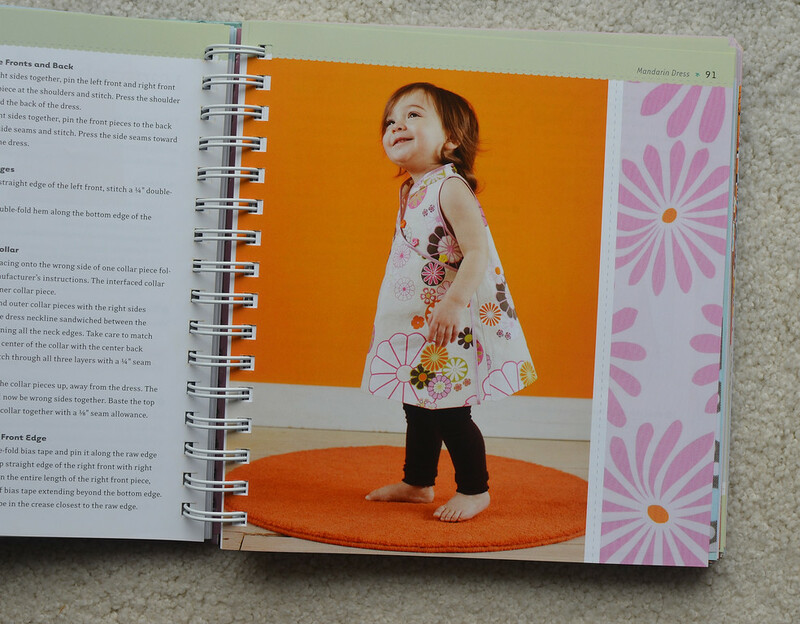 My latest sewing challenge was creating a fabric quiet book for my daughter. Created the pattern as well as the appliques for each page. I am in the US. and hope to win this fantastic book! I'm currently in the process of making a messenger bag. I do live in the US and my email address is tim at liston dot us. I loved the first One Yard Wonders book and would be thrilled to win a copy of the new one! My most recent challenge was advent calendars for my grandchildren (made 2). I used the machine embroidery designs from Meringue Embroidery. The challenge for me was all those pockets and finding the time to put it all together. Of course it was worth it in the end. They are both adorable and my grandchildren will enjoy using them for many years. I live in the US, Tennessee and would really love to win this sewing book and the fabric you are giving would be great too!! Thanks for the giveaway and Merry Christmas to you and your family. I am making sock monkeys, the first 2 are a little wonky, crooked tail, crooked ears, the babies won't care bout crooked. If I get the book, I am going to give it to Ashley @ hopeisfree. Doesn't our email come with the comment? EeeK! I just checked this book out from the library and it looks AMAZING! My most recent sewing challenge was sewing my kids Halloween costumes. There wasn't a Rapunzel pattern when I started or anything for Flynn Rider, so I had to fix and adjust other patterns until I got them both just right! I live in the US--thanks! Hi! I am smilingwoman, email mmsmiles@sc.rr.com, and have been living in South Carolina for 17 years now. I love to sew, quilt & machine embroider. 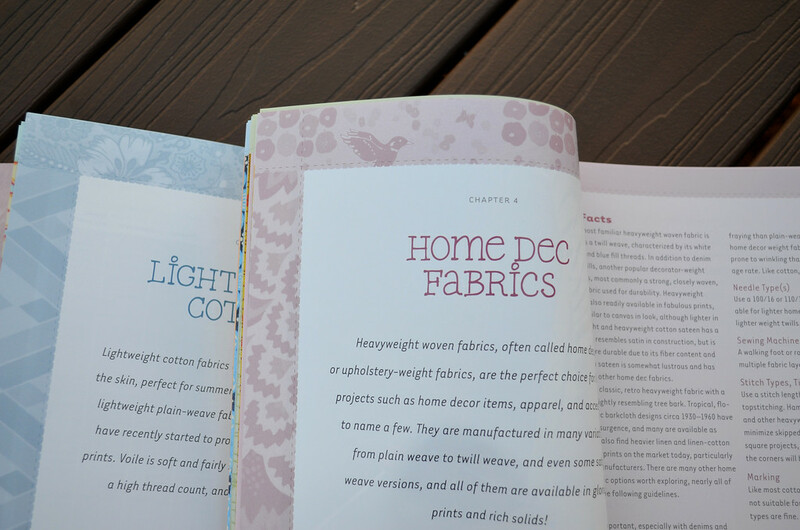 I am mostly self-taught and think this marvelous-looking book will help me understand different fabrics and give me exciting new ways to sew them. My biggest challenge to date has been sewing a purse insert with multiple pockets, pattern by Studio Kat Designs. I made it at the request of a friend, and made two. The first was a step-by-step rendering of the pattern that I kept for myself, and as I understood each step, I repeated it in my friend's chosen fabrics. It was a pretty intense project for me (I usually choose quick & easy), but the results were well worth the effort! I've been trying to learn to quilt lately, and that has really challenged me, especially doing applique work on quilts! I live in the US and my e-mail is msagala1 at gmail dot com. Hi, hand sewing Christmas decorations with the kids was challenging in a different sort of way. The 6 yr old can manage the needle and thread but the 4 yr old wants to participate too. Watch out when she starts sewing with a needle LOL! I live in Canada. Thanks for the nice giveaway! I recently sewed a spring skirt ... challenging just because I had to make sure it fit the recipient! I'm more of a quilter! This looks such a great book!I live in the UK!! Recently I sewed my first zipped pouch! not half as scary as I thought!! My biggest challenge was my daughter's halloween costume which had scallops on the bottom of the skirt (June from little einsteins). I wanted to maximize on the width of the fabric and get in as many scallops as possible, but had a hard time doing the math. But I suppose it was because I was sewing the middle of the night! Hi cute blog! My latest sewing project that is challenging me is machine quilting the quilt I just put together myself. It's proving to be quite the project and Not sure how well it will turn out, but I love the fabric so I hope it will! I recently challenged myself by making leather soft sole baby and toddler sandals for summer and designed my own pattern, I'm happy with how they turned out. We're in Australia so sadly no book but I'd love to win the fabric. My shoulder bag was really challenging, but I'm so pleased with it! My latest challenge was a new handbag with lots of pockets inside and out, and a different strap than I've tried before. I'm in Texas and my email is becky.theisen(at)austin.rr(dot)com. Hope you pick my number! And thanks for all your great tips and tutorials! I am a beginner, so learning how to sew a zipper on a pillow has been a challenge. I'm in the U.S. Sounds like a wonderful book. I recently had to make poodle skirts for my son's schools Christmas program and was only given a yard per girl to work with. It was a challenge but they turned out great. a recent sewing challenge for me was a pencil skirt for my niece---wanted a fitted look that is hard to achieve with elastic but didnt want the fuss of zippers and buttons. Thanks! The most challenging thing I have sewn lately has been a double wedding ring quilt - which as yet isn't done. I have had to take a couple of breaks from it, as it has really been a LABOR of love. It will be beautiful when I am done. I am in the US also. I think the last thing I made that was challenging was a custom Oxygen tank bag for a friend...button hole for the tubing, photo pockes, and a pocket for the tank tool...all with a lining and drawstring top! I'm still pretty new to the world of sewing, but I just made a hooded shirt for my mom and am working on a baseball tee for my dad. I hope to enter the world of quilting in the near future (I am presently learning as much as I can about it first). I live in the USA! I put the newly purchased darning foot on my machine to do some free-motion quilting! Luckily, I practiced on scraps a lot before attempting the actual quilt. Also lucky that my sister-in-law doesn't mind the 'homemade' look. Thanks for a great blog. It's been a favorite since I discovered it. I'm really enjoying the light project, too! This looks like a fantastic book! I just finished a wedding dress for my niece's American Girl doll for Christmas. Sewing such tiny clothes is a definitely a challenge for me! Thanks for hosting this wonderful giveaway :) I do live in the US. Thanks for the giveaway! 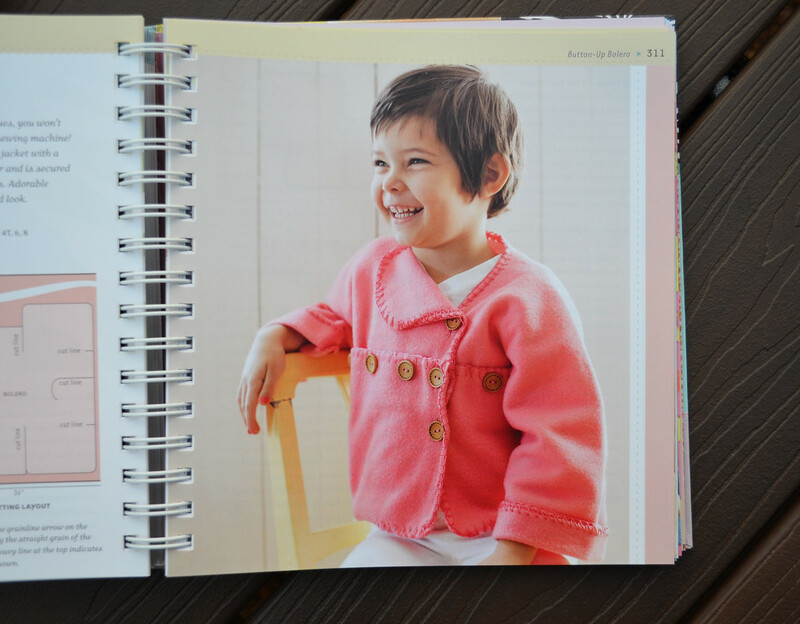 The latest project that challenged me was a fleece pea coat for my daughter. It didn't quite turn out. I do live in the US. I have recently begun altering sweaters. It gets a little dicey sometimes, and keeping the knit from becoming stretched is a little challenging sometimes...but it has been worth it! I do live in the US! neat! i totally want this book! i love being able to do a project with just a yard if fabric!! i just made my first pattern-less dress... it's for my little girl for christmas and hasn't been worn yet. my fingers are crossed. thanks for the inspiration and the fun giveaway! I made a flower girl dress that really challenged me. The fit of the pattern was awful and I ended up having to salvage it at the last minute. It turned out great, though. I sewed some superhero capes out of poly satin and it was a very challenging fabric! I'm also in the middle of making a backpack for the first time-- pockets, lining, zipper and all-- and I am going very carefully. We shall see how challenging in ends up being! I live in the US-- in temperate California. dress ups for Christmas. is it over yet? I am wanting to make mittens from some wool sweaters I tried to felt... but now holidays got the better of me. I do live in the states. danainalaska (at_) yahoo. Thanks for a great blog, by the way! The most challenging was a coat for me with a wool suiting fabric on the outside and a polarfleece lining. The lining was too heavy for the wool, so it showed under the seam. I had to alter the seam twice to get rid of that problem. Everything!!! I'm so short of time that anything I try to sew takes me five-hundred times more than it should and thus it's a real challenge. Actually, I'm trying to make a tree skirt that will probably be finished on August. With a bit of luck. I made a case for my sister in law's iphone with a purse and credit card holder on the other side. It was months in the planning (she's getting it for Christmas though it was meant for her September birthday) and quite a challenge for me as I've only recently taken up sewing and never done zips before. She'll probably hate it but at least now it's made I can sleep again without trying to work patterns in my head. Sadly I don't live in the states (UK). My email is arabellasargent at aol dot co dot uk. I have recently sewn a party dress, made for my daughter's requested school party. It was a quite challenge for me as I have never sewn a zipper before neither lining. I am not living in US. Merry Xmas and thanks for your blog. Looks like a great book! Thanks for breaking down the numbers on the different kinds of projects. Recently, I've been trying to sew a foldup Barbie bedroom. I've never worked with foam core board before and trying to sew around it has been an extra challenge. I love trying fun new sewing projects! I live in the US and would love a copy of this book. I am now making a Rapunzel costume and am struggling to finish it for Christmas! 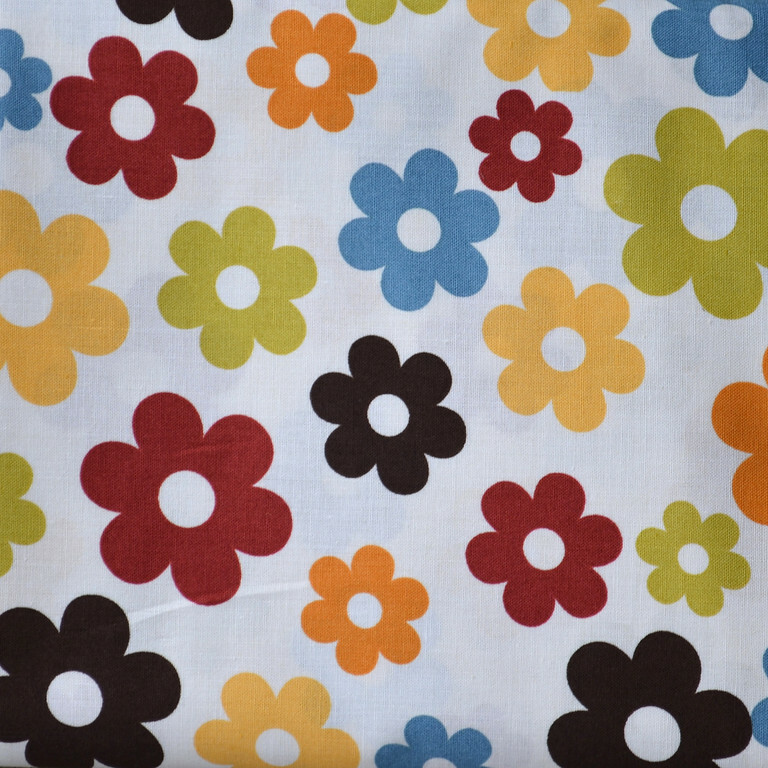 Lots of hand sewing little flowers and I have little patience right now! I am working on some mermaid softies and I couldn't just stick to the pattern- no! I had to "simplify" it, so they are taking even longer, since I have 4 girls to make them for. By Sunday. I would SO love to win this giveaway! Thanks for the chance!!! What a great giveaway! The most challenging thing I've sewn lately is a Medieval era dress for my best friend for the 12th night festival at our church. I'm mostly a quilter and it's been ten years since I sewed clothes. 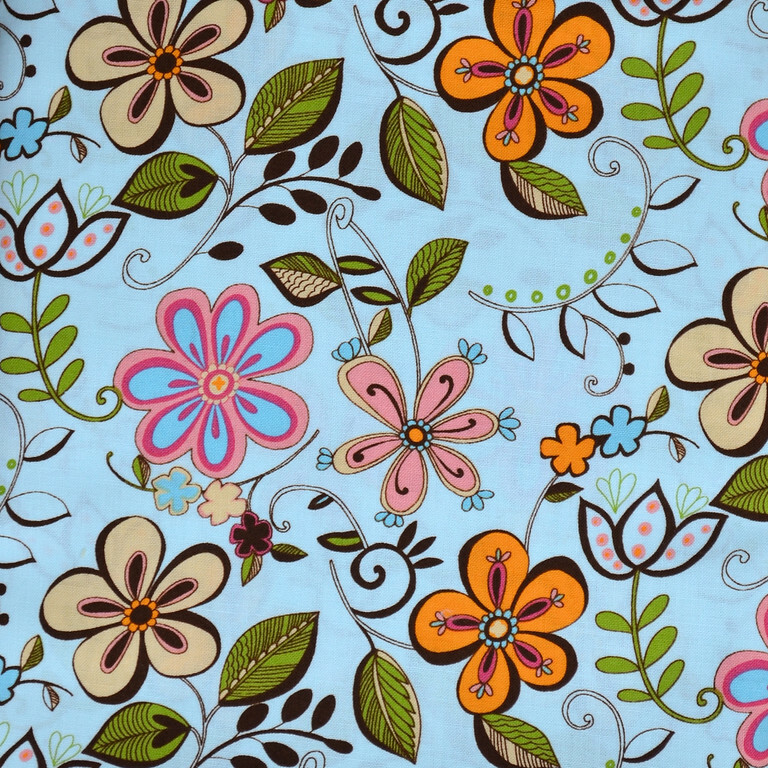 And of course, I was using a commercial pattern so it didn't fit quite right and I had to make a bunch of alterations. Yick! I'd love to win this book though! I just recently joined your email list and LOVE your blogs! So creative and inspiring! I tackled my wedding dress without a pattern. Amazing book! I really want it! The latest thing that challenged me was something I already knew how to do! I got a new machine recently (a Brother) and had to figure out how to use elastic thread with it. After some searching, I figured out that I had to adjust the bobbin tension. I did not have to do that with my old machine, but it worked! I really don't sew much, but my nine year old took sewing camp with Grandma this past summer and I know she would love this. My sewing projects mostly involve hand sewing my crocheted projects together. I am currently picking apart a number 2 that just did not turn out quite right and the hardest ends to find are the ones where I hand stitched the two parts together. Wow! That was the most comprehensive book review I've ever read! The most challenging recently for me was sewing a bottom circle onto a stuffie. I was a wreck about evening out the fabric gatherings. 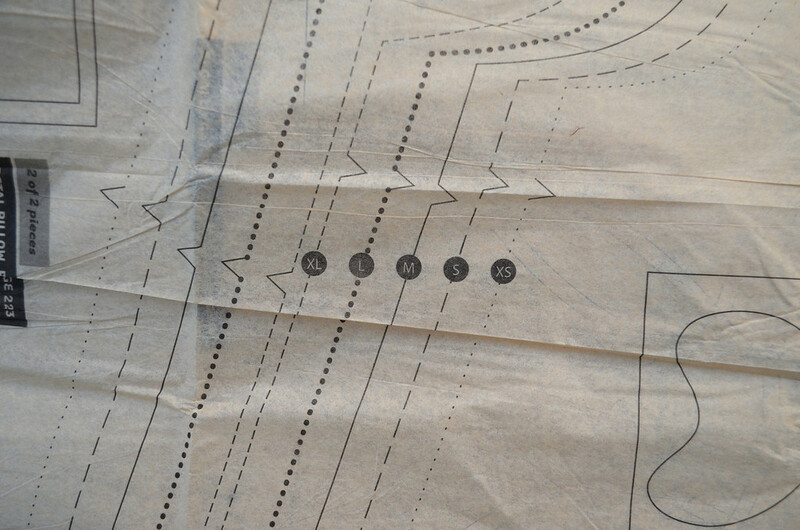 Next I'm going to try hand sewing those drunkard path type quilt block. I'm a USA resident. Sewing anything right now is challenging because of trying to find the time to do it. I just completed my first embroidery sampler. It was challenging by fulfilling. I'm trying (and doing) a few sent bag, to be a Christmas present. They would be super easy to do, if I didn't want to do some tiny applique on them. I have a non-US address (Portugal). I recently decided to sew the entire family's halloween costumes. Since I can never do anything easy, I decided to go all out, use fabric I'd never sewn on before, and make alterations! I was up all night for 3 nights straight, and completely redid my pirate wench skirt. But in the end, The pirate costumes for me, my husband, and my son looked amazing, and my daughters ELABORATE Cinderella dress...yes, for a 2 year old...looked to die for! I will never do it again...well, I say that, but I know I will! I'm in the USA!! Deep in the heart of Texas! One recent sewing project that has challenged me is a totebag with a hidden zipper. Either the instructions weren't written where I could understand them or I wasn't paying enough attention!! I'm sewing a pleated pouch right now. And zippers are still a bit challenging and the directions are a little sketchy (so I have to read/guess between the lines). But I'm getting it figured out. I was challenged recently by piping. My boyfriend and I recovered a chair I got from Freecycle for our 15 month old daughter. I had an idea my first time reupholstering would be difficult but did not expect the sewing part of the project to be such a challenge. I made my own piping for the back trim to cover staples from leftover chair fabric and since I don't have a piping foot I figured I could easily use a zipper foot. Wrong. I fought with the cording and the material the whole way. Tears, cursing, the whole bit. And after struggling with the piping and finally getting it finished (it wasn't pretty), my boyfriend decides that the piping won't work to cover the staples and we'll have to go another route! I can laugh about it now but last weekend..well, I was ready to toss the chair, fabric, sewing machine AND boyfriend out into the yard!! LOL!! I just finished a dress out of corduroy for my daughter for Christmas...and it actually ended up being the size and shape it was originally intended to be. Yay! I can't finish my GFG quilt. I hope to able complete it by 2012. Thanks for the wonderful giveaway. I'm an international reader. Hi! I am Ana, from Portugal (so I am only "applying" for the fabric)! Last night I was sewing car play mat for my youger kid (2 yrs old) and at some point I got stuck and couldn't figure out how to finish it! Such a simple project and such a challenge! In my defense I have to say that it was very late! Well, it happens, I guess. i was very challenged to make some pillows lately- sounds silly, they are easy to sew, but it was the very delicate fabric and the running out of thread in the middle of the night that was challening- oh, and the christmas deadline! I sewed 3 neckties for my 2 boys and one for my nephew. It was a little difficult for me to say the least! But, unless its curtains or pillows, everything seems to challenge me in the sewing world! My email address is ashleycompton11@gmail.com and I live in Meridian, ID, USA! I recently sewed a stuffed teddy for the first time. I usuually sew garments and not crafts but I'm trying to expand my horizon. :) I found quickly that it's very important to make sure you definitely reinforce your stitches in those little corners! My current sewing challenge is to find my sewing machine :-) We recently moved and the basement is a chaotic jumble, but my New Year's resolution is to carve out an awesome craft space! I am in the US and would love the book or the fabric. Thanks for the chance to win! I made a button down trench coat style jacket for my son. The fabric was tricky to work with and the pattern was hard. I love how it turned out--too bad my son doesn't agree. I soon will have a baby cousin and decided to make my very first quilt for her. I did a rag rug to start of easily, but it was still very challenging sewing on such a big scale! I made a big civil war era ball gown that was more a challenge of patience than anything. I finally had to move it to my living room to get it done in time. I'm attempting a Feliz Dress (from the book Clothes Kids Love) for my daughter for Christmas. It is not going well, but I just found a sew-a-long with more detailed instructions. So I'm hoping tonight's attempt will go better. Recently? Like yesterday? When I attempted to sew way too many layers together (of this really fabulous touch & feel colors book I have been working on for WEEKS) and then broke my BRAND-NEW serger? Yes. That was challenging. I kept going, however (not because I am all about meeting challenges head-on, but because Christmas is in three days), and banged out two dresses and two hooded towels. Sadly, the book has been abandoned (I have no brain space left to problem solve) and my niece will be receiving a Wonder Woman Little People car and Sesame Street toys instead. Sigh.